The OSRC will be celebrating it`s 30th anniversary - and the Illinois River - on Saturday, Oct. 13th at Diamondhead Resort on Hwy. 10 (northeast of Tahlequah). The festival will run from 2:00 - 7:00 pm and will offer fantastic music including several musicians from the cd Songs for the Illinois River, Barton and Sweeney Trio, and Red Eye Gravy. There will also be over 20 booths filled with fun activities and interesting information ranging from environmental issues to outdoor recreation. Local civic groups and non-profits will be vending a variety of food, and there will be several different events taking place by the river throughout the afternoon. Click here to visit the 2007 Illinois River Fest webpage! This year summer temperatures sure have been hanging around a long time in Oklahoma! Despite the hot weather, water levels around the state are not too bad. The trees around my house are already turning the leaves loose. The Illinois River, The Washita River and the Lower Mountain Fork River all appear to have good water levels for paddling. I think Dianne and I might even try to slide down the Lower Mountain Fork River this weekend. 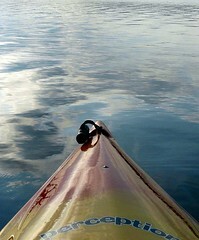 It will be nice to paddle with some current again, the lake kayaking is starting to get a little old. I won a photo contest! Can you believe it? 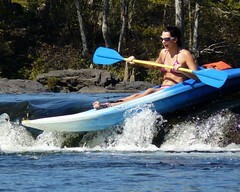 PaddleDogNation.com is another online community for flatwater paddling enthusiasts. Although not local in scope, I really dig the funky, fun theme of PaddleDogNation. As you can see in the cap image on this post, they have a really cool logo. Stop by PaddlDogNation.com and check out their monthly photo contest. I won a cool wooden canoe paddle... that I just can't wait to use. I won a Fox Worx Classic Bent Shaft Canoe Paddle from Mountainman Outdoor Supply Company, the September PaddleDogNation Photo Contest sponsor. 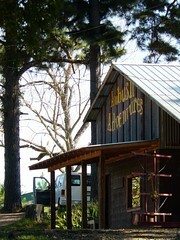 In other OklahomaRoadTrips.com news: I added a couple new pages to the main site. One is on Okmulgee area paddling and the other page is on Eureka Springs Arkansas paddling. A guided kayak adventure on the Cossatot River is available from 10:30 a.m. to 3 p.m. Oct. 5, 2007 at the Cossatot River State Park. The outing is offered to everyone regardless of kayaking experience. The cost of the trip is $20 per person ages 14 and older and $15 per person if you bring a kayak. The program is weather dependent and the trip will go on unless the river is too high or too low or if the weather is severe. Participants are encouraged to bring the following items packed in a waterproof bag/container: sunscreen, 2 quarts drinking water, snacks, camera, hat and sunglasses with safety strap. Dress in layers and wear sturdy shoes that can get wet and are OK for walking on the rugged shoreline. Kayaks, paddles and lifejackets are provided with the program fee. Space is limited and reservations are required by calling 870-385-2201. Payment is requested on arrival at the Cossatot River State Park Visitor’s Center classroom on Arkansas Highway 278 between Umpire and Wickes.